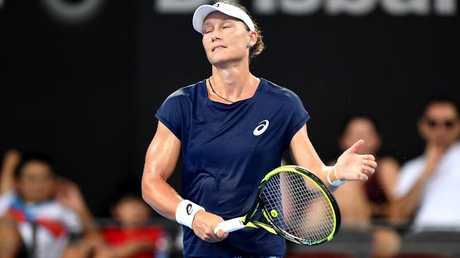 TENNIS: Samantha Stosur has shrugged off a showcourt snubbing and a stubborn opponent to safely reach the second round of the Sydney International. 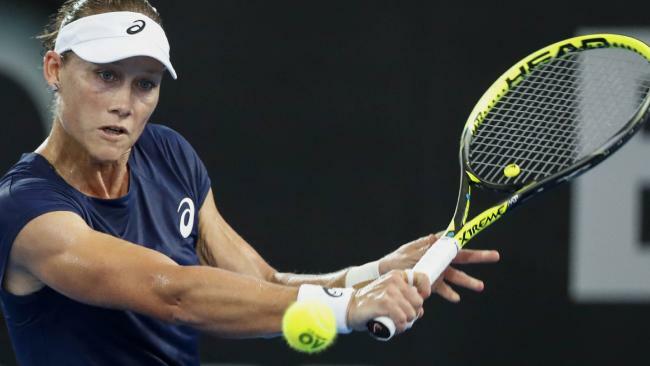 Stosur was chuffed to rebound from a first-round exit at last week's Brisbane International with a gritty 4-6 7-5 6-3 comeback win on Tuesday over rising German Carina Witthoeft. Australia's only grand slam singles champion in the past 15 years was shunned to court three at Sydney Olympic Park, where fans crammed in and stood six deep outside to get a look at the former US Open champion and world No.4. Stosur didn't disappoint, digging deep late in the second set - when she stood only two points from defeat - to finally prevail after two hours and 21 minutes. Samantha Stosur reacts after dropping a point. "It was a little bit strange, but it is what it is. There's lots of matches to go on these courts. I will play anywhere," Stosur said. "I got a win, so I'm happy. Yeah, I'm not too big for my boots to go out to court three." The victory will serve as a much-needed confidence booster ahead of the Australian Open starting on Monday in Melbourne. The 33-year-old has failed to venture beyond the fourth round of her home grand slam in 15 attempts but will arrive this time with at least one summer win under her belt. "Don't even know when the last time was. Whenever that was, it's nice to do it again and repeat it this time around," Stosur said of her lean run over the years in Sydney. Last year, as well as 2013, the Queenslander crashed out in the first round in both Brisbane and Sydney, where she failed to win a match in six visits since losing to Alicia Molik in the 2005 final. Stosur next faces Australian Fed Cup teammate Daria Gavrilova - who are 1-1 head to head - for a place in the quarter-finals. Gavrilova survived a thunderstorm and some lightning shot-making from fearless compatriot Olivia Rogowska, as wet weather left her hanging one game away from victory before she resumed two-and-a-half hours later to complete a 6-4 1-6 7-5 win at Olympic Park on Tuesday night. Rogowska was serving at 4-5 down in the deciding set when play resumed. 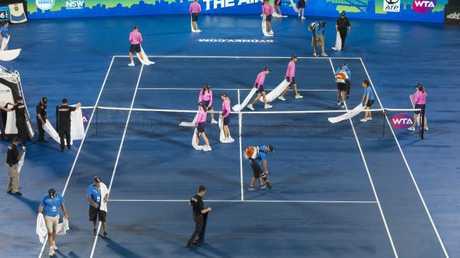 The wildcard saved one match point on Ken Rosewall Arena before eventually succumbing to the world No.25 after two hours and 12 minutes of on-court action. "Dasha warmed me up this morning. We know each other very well," Stosur said. "There is not really going to be any secrets out there." The winner will likely face top-seeded Wimbledon champion Garbine Muguruza for a semi-final berth.